Top 5 tactical watches that the world has ever seen! All of us like to feel a little tough at times. Often, things associated with the military are perceived as tough. Therefore, it is no surprise that there exists a product for normal consumers that were inspired by military equipment. GPS is one such example. While it was developed for use in military, they soon opened it up to the world in lieu of commercial air travel safety. Similarly, the folks in the military needed a rugged watch to suit their needs. Hence, companies like Rolex complied and made some of those for their use. Now, military tactical watches have become a premium segment in the timekeeping market. Now, defining “rugged” is easy but many normal consumer watches also encroach upon that territory. Hence why I have compiled the list of 5 best tactical watches. These military tactical watches are the cream of the crop. Therefore, you won’t have to worry about appearing poor to others because you had to buy a cheap tactical watch since you didn’t know any better. Without further ado, here are the 5 best tactical watches. In this list tactical watches, this one is quite subtle in its approach. This beautiful watch is made out of 18 ct. “Brushed Pink Gold”. The case is 44 mm in diameter and encompasses a brown colored dial inside. Its markings are in Arabic Numerals and glow in the dark. 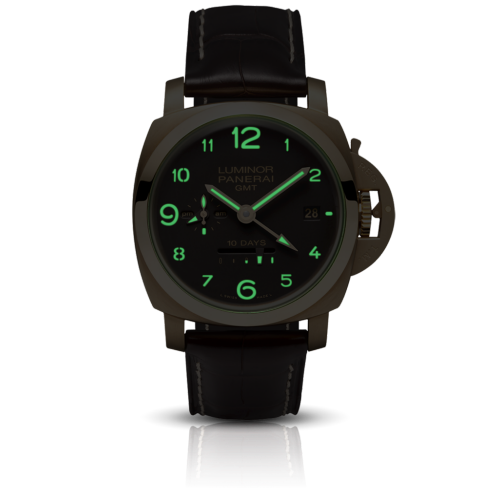 Here’s the Panerai during the night. The functions of this tactical watch include Hours, Minutes, Small Seconds, Date, GMT. A 24h indicator, Power Reserve Indicator, and Seconds Reset functionality is also available. It features Panerai’s P.2003 movement. The entire movement was designed and created by the folks at Panerai Neuchâtel. This automatic calibre features a 10-day power reserve. The power reserve is indicated by a linear indicator on the dial. It features a free-sprung balance wheel with inertia regulation; 28,800 alterations every hour and much more. This movement is constructed out of 281 components and is quite complex. Fitting for a military tactical watch. 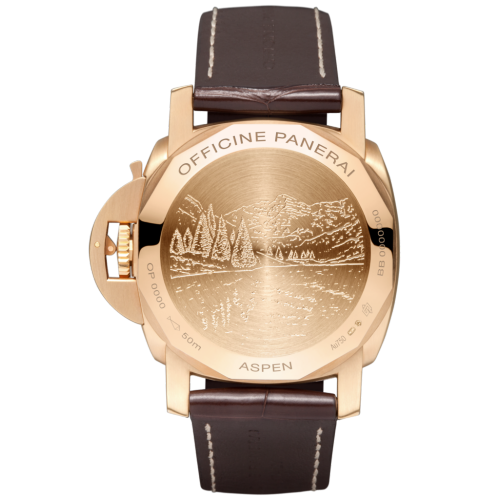 The beautiful back of the Panerai. This beauty will cost you around $41,500. Only 10 of these exist. The price is in the ballpark of good military tactical watches. The fact that it’s from Panerai is just a bonus. Serious instrument for a serious profession. One of the best tactical watches around, this watch’s name is as big as the list of its qualities. This watch has an 18 ct. 5N gold case with a 43 mm diameter and a height of 15.9 mm. It has a sapphire glass back that is see through. All so that you are able to appreciate it’s IWC manufactured movement. The IWC 89630 calibre powers this military tactical watch. 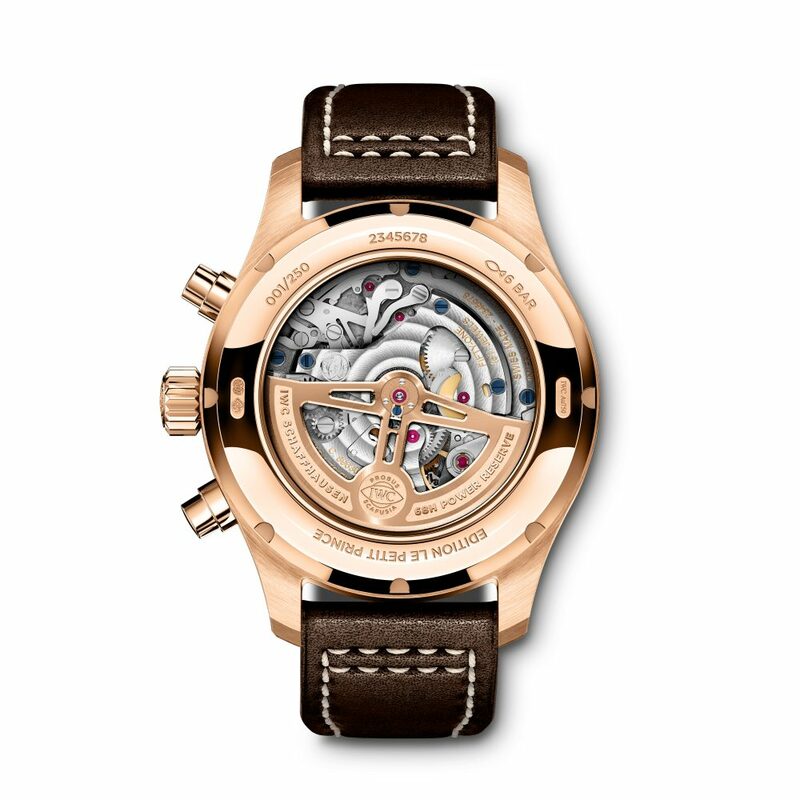 This is an automatic, self-winding unit that has 68 hours of power reserve. It is made out of 399 components and features 51 jewels. This movement also has the Cotes De Geneva certification. This means that this watch is very accurate and among the best in the business. WIthout a doubt, it is a thing of beauty. The features of this tactical watch include a perpetual calendar with displays for the date, day, month, year and phases of the moon. Its chronograph has hours, minutes and seconds function. A totalizer at 12’o clock combines the hour and minute counters. The glass has been vacuum sealed against the displacement. There is an anti-reflective coating on both sides. 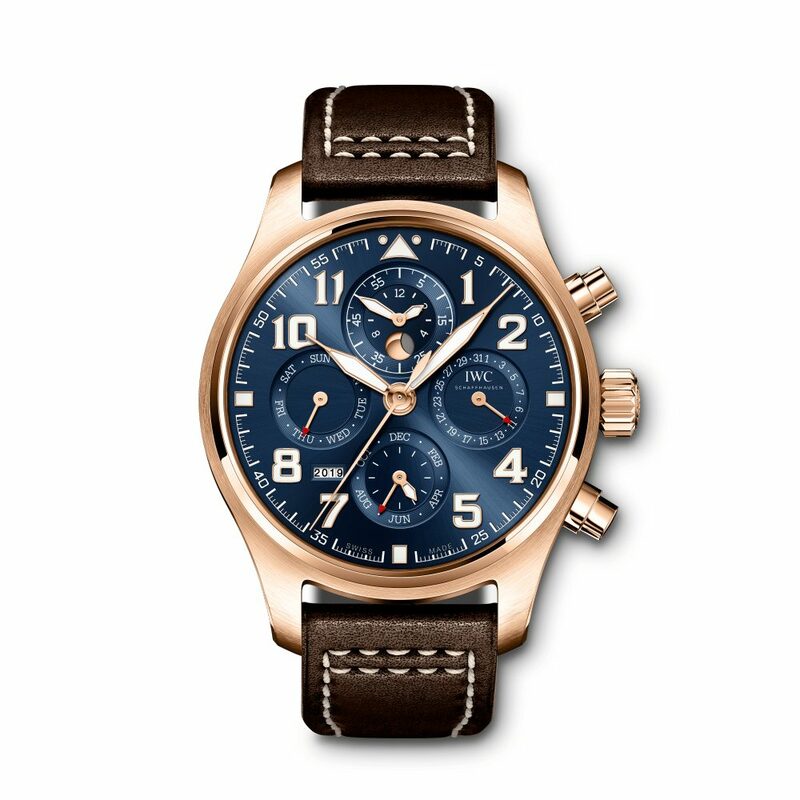 The IWC 89630 is much cooler than what its name suggests. This military tactical watch comes with a strap made of brown calfskin. You are also free to show-off your amazing watch since unlike real military personnel you don’t have to fear to give your location away. In fact, that’s what you want! This gorgeous tactical watch will undoubtedly draw a lot of attention to you. The cost of being so eye-catching is $43,600. Though, be quick to get it as only 250 of these are there in the world. 3.) 1968 Republic Limited Edition PRIM Orlik 55 L.E. The watch being showcased as a part of a collection. This tactical watch has an awesome origin. 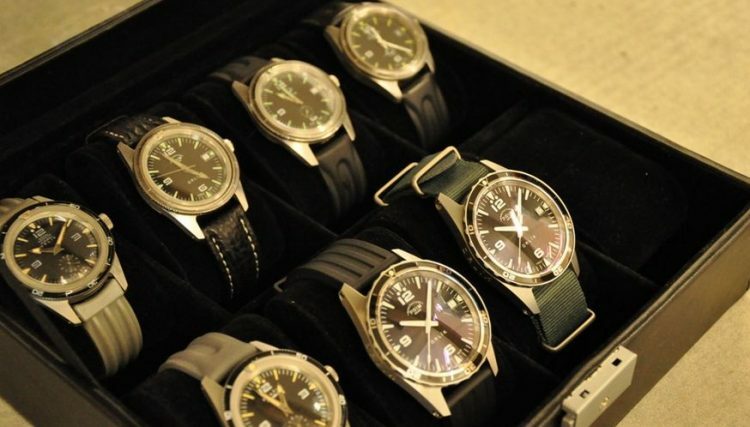 The Ministry of National Defense ordered PRIM to make special watches for their military. The factory of Nove Mesto was assigned the task of making these watches. The folks at PRIM didn’t hold back a bit and gave a plethora of features to this watch. The watch is around 42 mm in size. Instead of being constructed from Stainless Steel, this tactical watch was made out of Phonix MAZ. What the hell is Phonix MAZ you ask? Phonix MAZ is a special kind of Stainless Steel that doesn’t reflect light. This meant that it could be safely worn at night when there was plenty of moonlight. The wearer wouldn’t have to fear an accidental reflection giving their position away. The glass is also of a special non-reflecting variety. The glass used is known as Umaplex and it’s great for resisting high pressures. To meet the need of this tactical watch a 2.7 mm thick piece of it was used to ensure that it absolutely worked under pressure. This military tactical watch also offered fluorescent markings along with high shock resistance. It was water resistant up to 5 ATM and was seen on the hands of military divers occasionally. Nowadays, one of these can cost around $50,000. Getting one is another story though as they aren’t easy to come by. 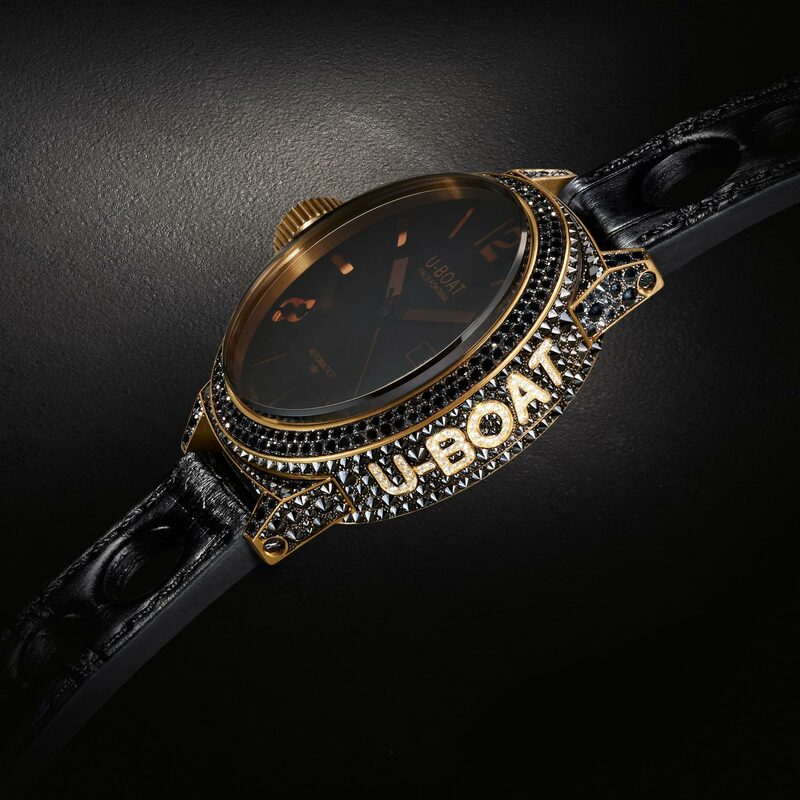 This blinged out military tactical watch from U-Boat is a definite feast for diamond lovers. This is one of the most exclusive and luxurious watches ever as well. 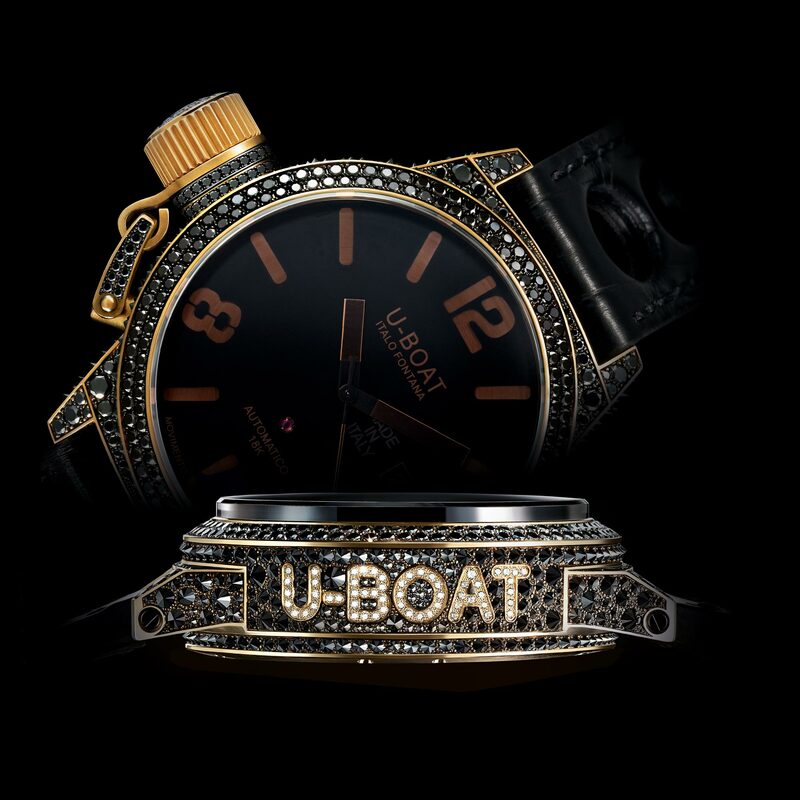 The 45 mm case is made fro 18 ct gold and is completely encased in white and black diamonds. The diamonds give a nice design characteristic to the watch. The diamonds differ in size and some have been set backward to look spiky. The gold case of this military tactical watch features a satin finish that’s been done by hand. There is a distinguishing crown on the left side with a patented protective device alongside it. The crown is also made of 18 ct gold. All the diamonds have been meticulously hand-set on the case and buckle. The back is also made of 18 ct gold and is sealed with 8 external screws. As beautiful as a swan. The dial of this tactical watch features a visible ruby. 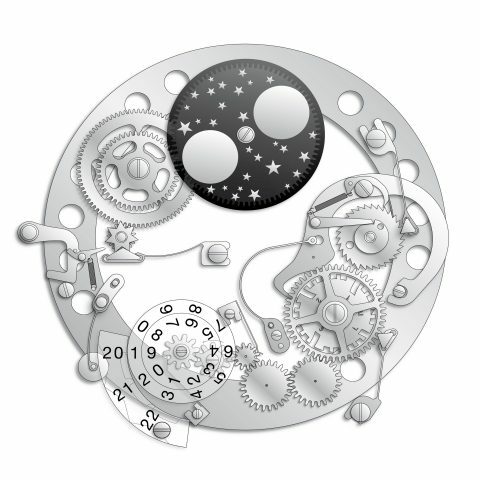 Also, the dial is quite unique since it itself is made up of two dials that have been superimposed via witchcraft. One of those dials is made of 18 ct gold. The other has been cut and treated with high tech composite opaque black pigments. The kind that is used in military applications. The strap has been made from hand made and hand finished alligator black leather. It has a gold buckle at the end. The movement of this watch is also made from gold. 22-carat gold to be precise. This gives this tactical watch a reserve of about 38 hours. Looks like a stylish grenade. 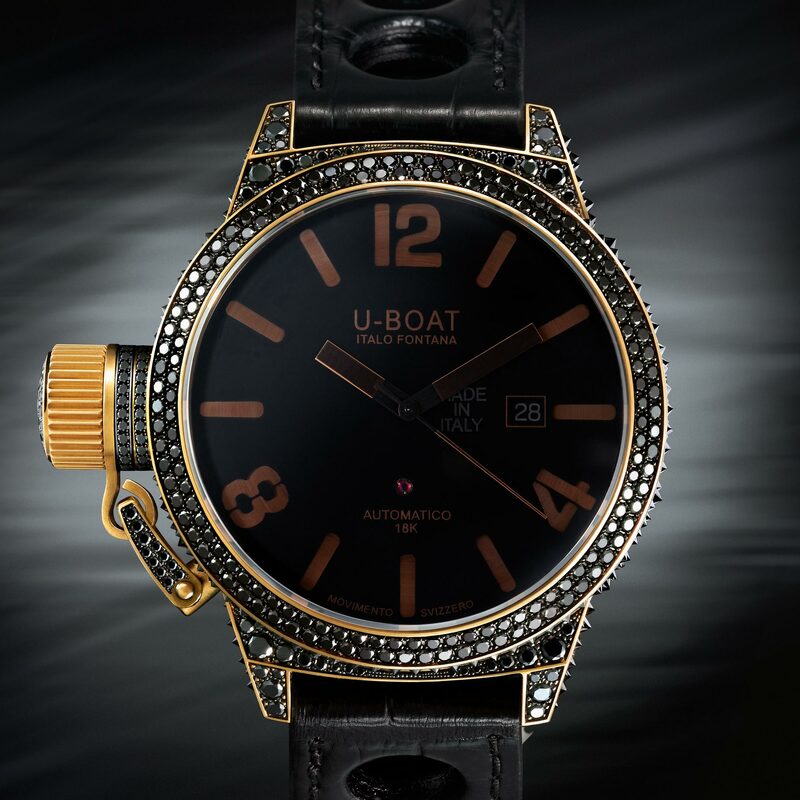 Needless to say, this military tactical watch from U-Boat is a serious offering. Therefore, it’s price of $104,460 should not be a surprise. All things considered, this one is genuinely one of the best tactical watches around and you should definitely give this one a try. Looks like something Iron Man would wear. This is quite easily the king of all the military tactical watches. Calling this one the Ferrari of watches wouldn’t be an understatement either. 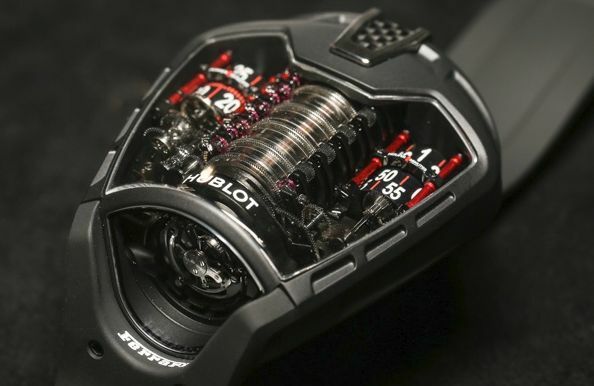 Since the folks at Hublot got together with Ferrari to design this thing. And they did a phenomenal job at that. This tactical watch looks great from every angle. The designers decided to showcase how beautiful the inner machinery can be. This desire was successfully captured and brought in front of this world in the form of the La Ferrari Aperta. This watch is pure art. Looks just like an engine. But, it isn’t designed to be just beautiful. It is quite practical as well. How practical you ask? Well, it is practical enough to work non stop for over a month since it features a 50-day power reserve. Eleven barrels were used to make this feat possible. This military tactical watch also features a suspended vertical tourbillon. Now, every watch enthusiast worth his salt knows that a tourbillon is as complicated as things can get. Video showcasing every nook and cranny of the watch. But no! This military tactical watch features an even more complicated self-winding system. The system utilizes a special drill-like device and a unique connector. The purpose of the connector is to let you choose between winding or changing the date/time. Quite an ingenious solution. All this mechanical goodness is protected by a polished and smoked sapphire crystal. The crystal looks stunning and gives definition to the watch’s innards. With all of this, you may be wondering that the strap might be made of kevlar or something similar but I assure you that it’s made of the humble rubber. Ablogtowatch.com’s hands-on review of the watch. Though, that strap should not give you any wrong ideas regarding the price of this military tactical watch. It’s as expensive as you think it is. 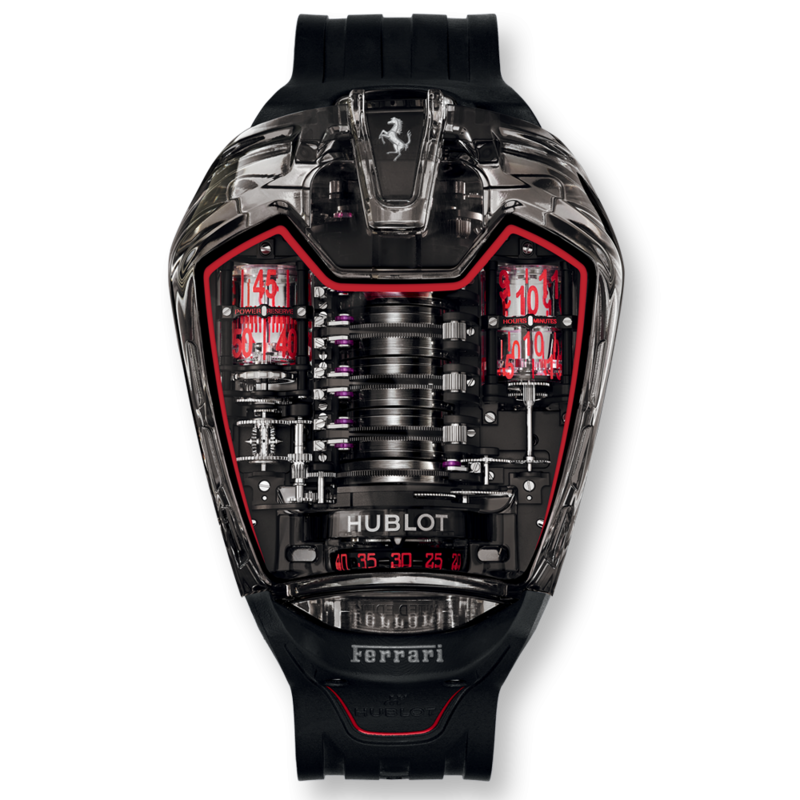 At $525,183 this watch is quite expensive. But, one should also consider that it looks the best out of all the military tactical watches in this list. Definitely a unique item worthy of its price!